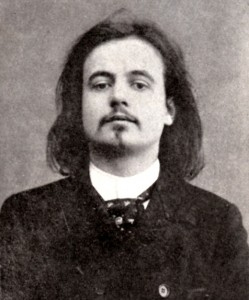 This is Alfred Jarry. I ran across this photo kind of randomly. He looks just very contemporary, so I looked him up. Turns out he was an archetype Artistic Genius. French, iconoclast of the first order, famous and successful in his day, into absinthe, probably gay, died penniless at 34 in 1907, of TB exacerbated by drugs and alcohol, novel published posthumously, unknown today. The whole package. His last request was for a toothpick. He rode a bicycle. Picasso admired him, did a sketch of him, and bought up his estate after he died. Pioneer of the symbolist movement, now seen as a forerunner of Dada. He added a key element to the movement when he defined “pataphysics” as “the science of imaginary solutions, which symbolically attributes the properties of objects, described by their virtuality, to their lineaments”. Thats pretty Dada precursive right there.